GLOBAL PICTURE inhabits local urban site which has already been established as a location of certain urban significance. The daily changes are dependent on a set of parameters taken from daily online reports on the global economy, stock markets, disasters, health, international relations/conflicts, civil rights, ecology and media. 7 states from bad to excellent are turned into the colors: from blue, turquoise, green, yellow, orange, and red to purple. Every 20 minutes a central software performs keyword-based search on the internet and after analysis of collected data via internet database delivers necessary information regarding current state of GLOBAL PICTURE to on-site software applications. Those software applications then using different LED hardware interfaces are displaying current color. 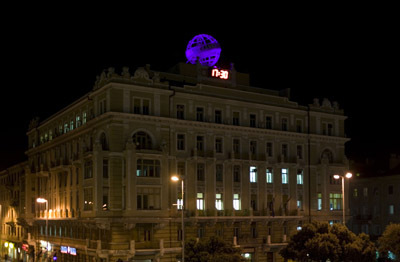 RIJEKA 2009/ An existent large globe-shaped object on the roof of a building in Rijeka harbor representing the logo of the Transadria company, serves as an object for visualizations of changes in the global picture of humanity. The globe is lit (by color LED scanners) in a certain color which changes constantly. 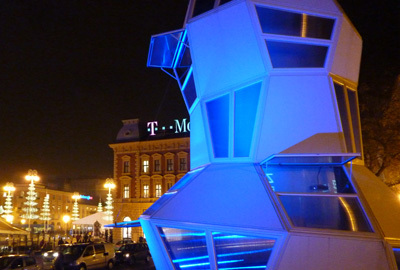 ZAGREB 2009 / Pavilion/09 built by Studio Njiri�?+architects as a temporary urban site is lit up in a corresponding ever-changing color. The image of the 3 simultaneous sites are projected on 3 video projection screens in the pavilion. 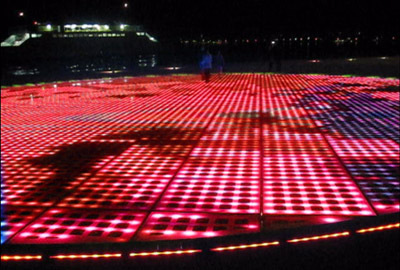 ZADAR 2010/ A corresponding ever-changing color appears on the round screen of the Sun, an urban site with a big LED monitor built into the pavement in the port of Zadar (project by architect Niko Ba??i�?). LJUBLJANA 2011/ A clock tower on the building of Ljubljana Central train station is lit up in a corresponding ever-changing color.